After you determine your candidacy for bariatric surgery, the bariatric surgeon will recommend weight loss procedure options that best suits you based on your health, BMI, and devotion to the procedure. Here we will be explaining each procedure in detail and its pros and cons for you to see which weight loss surgery option fits you best. Remember each procedure makes biological differences in anatomy that affects the body impacts your lifestyle. Roux-en-Y Gastric Bypass (RYGB) is often compared to the newer procedure Duodenal Switch w/ BilioPancreatic Diversion (DS/BPD). Both are very similar in method of weight loss, but both have slight differences that make each surgery ideal for particular individuals. Duodenal switch is a newer procedure than Gastric Bypass and is reserved for morbidly obese patients (BMI>50) or patients who want to be really skinny. It is also worth mentioning about Mini Gastric Bypass (MGBP) and Single Anastomosis Duodenal-Ileal Bypass with Sleeve Gastrectomy (SADI-S or SIPS). 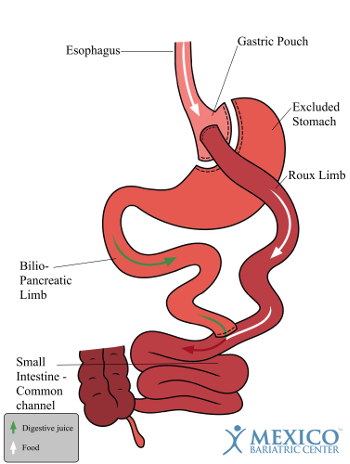 Mini Gastric Bypass, a modified version of gastric bypass, is often compared to SADI-S, a modified version of Duodenal Switch. Gastric bypass surgery has a lot more long-term data and results than its newer counterpart, duodenal switch surgery. The patient needs to weigh out the risks and rewards of each surgery. The duodenal switch has more expected weight loss than gastric bypass surgery, although it also has many more potential complications than RNY. The RNY bypass has been known as the gold standard of bariatric surgery and has been around since 1967. 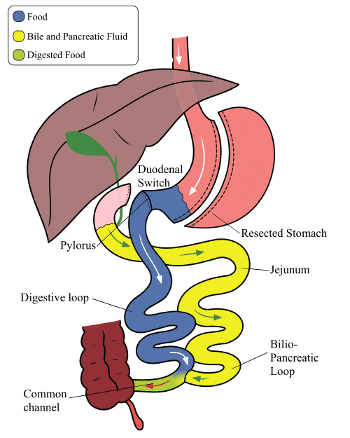 Duodenal Switch w/ BilioPancreatic Diversion, otherwise known as vertical gastrectomy with duodenal switch, is a very powerful weight loss surgery that combines restrictive and malabsorptive methods to produce high expected weight loss. Duodenal switch is the most complicated weight loss surgery that is similar to gastric bypass but with less practicing surgeons. Gastric Bypass Surgery, otherwise known as laparoscopic Roux-en-Y Gastric Bypass, is the gold standard in bariatric surgery with good reason. Ever since 1994, gastric bypass has been performed and perfected, allowing researchers to study the long-term results. This allows patients the peace of mind to choose a well-established weight loss surgery. Patients can expect to lose 75% to 80% of excess weight. Some Patients can lose too much weight. More risk of nutritional deviancies than with the RNY gastric bypass. Patients can expect to lose 70% of excess weight. Less able (patients who loseDoudenal Switch. Patients must eat three meals a day. Patients must strictly adhere to protein and vitamin supplements to avoid deficiencies. (Multivitamins, ADEK vitamins, Calcium, and Iron for Menstruating women). Patients must eat three small meals a day. Patients must avoid sugar and fats to prevent Dumping Syndrome. The Duodenal efficacy, is effective for patients with a BMI of > 50kg/m2. Those with a BMI of <45kg/m2 may lose too much weight. The Duodenal Switch has a higher incidence of complications than any other weight loss surgery. Patients maintained a 79% loss of excess body weight. 9% (at 1 year) and 6% (at 2 years) of patients had failed to lose at least 50% of their excess weight. Patients maintained a 67% loss of excess body weight. Nearly 20% of patients had failed to lose at least 50% of their excess weight. Gastric bypass surgery is the most popular weight loss surgery but doesn’t provide the highest expected weight loss. Duodenal Switch provides the highest average expected weight loss available yet and comes with more risks and complications. Duodenal Switch (DS/BPD) also offers the highest degree of remission for comorbidities, such as type II diabetes and hypertension. In the duodenal switch, the stomach size is reduced and the pyloric valve, or pylorus, stays untouched. The more restrictive stomach may result in increased gastric pressure by reduction in gastric emptying and decrease in volume. In gastric bypass surgery, however, the pyloric valve stays in the separated stomach and is completely bypassed. This means the pylorus does not have the ability to regulate food as it goes from the stomach to the small bowels. 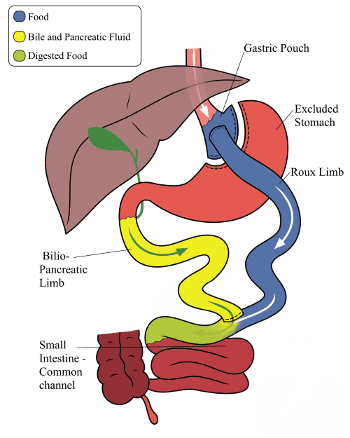 The new pouch that is created in gastric bypass surgery redirects almost all of the stomach acid to stay out of the esophagus. Therefore, the Roux-en-Y gastric bypass is best for patients with severe acid reflux and/or gastroesophageal reflux disease (GERD). Dumping syndrome is an abdominal discomfort accompanied by rapid heart rate, palpitation, nausea, vomiting, and explosive bowel evacuation. Dumping syndrome often occurs in gastric bypass patients because of the constant flow of food from the stomach to the small bowel. Gastric bypass doesn’t regulate the food digestion process which causing dumping syndrome to occur. There are two categories of dumping syndrome that bypass patients face. Early Dumping Syndrome – Instantly after eating food. The primary symptoms of early dumping syndrome are abdominal pain, cramping, nausea, and light-headed. It is estimated that over 50% of bypass patients experience dumping syndrome at one point or another. Staying on the post-op diet and keeping in touch with your nutritionist usually fixes this problem. Often times, RNY patients outgrow the symptoms. 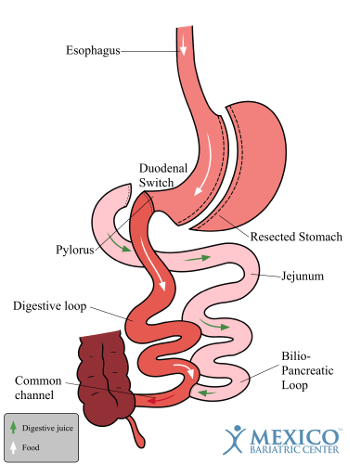 If the patient has had or currently has ulcers, the duodenal switch is recommended over gastric bypass surgery. The pouch that is formed with bypass surgery is so small, it is referred to as the “blind” stomach. It is nearly impossible for ulcers to be detected without a doctor laparoscopically scoping the stomach under anesthesia. The surgeon generally uses one of the incisions that was used during the gastric bypass procedure. Taking Aspirin or Non-Steroidal Anti-Inflammatory Drugs (NSAIDs) also increases the risk for ulcers in patients with gastric bypass. Both procedures cure comorbidities like Types II Diabetes and hypertension, however, duodenal switch surgery is much more effective with remission of obesity-related diseases. Duodenal switch procedure also shows a much quicker result in its metabolic effect. Gastric Bypass Surgery costs range from $5,995 to $19,000 depending on where the surgery takes place. In Mexico, the cost of gastric bypass surgery is as low as $5,995 and still is a high-quality procedure. In the United States without insurance, RNY ranges from $15,000 to $30,000 for patients. The duodenal switch surgery costs anywhere from $6,000 to $35,000 depending on what region and country you get DS surgery. At Mexico Bariatric Center, we pioneered the duodenal switch surgery in Mexico and have some of the most highly trained DS surgeons in the industry. The price for duodenal switch in Mexico is only $6,995. In the United States, the DS costs between $20,000-$35,000. The criteria for bariatric surgery insurance coverage follows strict guidelines for patients who get accepted. The process takes on average one year just to be officially approved by the insurance company to get weight loss surgery. Patients must follow the pre-op diet while meeting medical professionals including psychologists and nutritionist before approval. There are much fewer complications associated with gastric bypass vs duodenal switch surgery. The risks and complications include excessive/internal bleeding, infection, blood clots, dumping syndrome, malnutrition, and ulcers. As a newer bariatric procedure, the DS has a variety of complications that occur more often due to less experienced surgeons. The duodenal switch complications include nutrition deficiency, leakage, infection, hemorrhaging, blood clots, and protein malabsorption. The new digestive tract after duodenal switch surgery is also changed through both restriction (by resecting about 70% of the stomach similar to gastric sleeve) and malabsorption (bypassing a large portion of the small intestine). A larger portion of the small intestines is bypassed, or switched, which causes the DS patient to need more vitamins and supplements for their lifetime. The anatomy is more intact, although less protein and fat is absorbed causing more nutritional deficiencies. The digestive tract after gastric bypass surgery is changed through both restriction and malabsorption. First, the stomach is formed into a small pouch called the stoma. This tiny pouch doesn’t regulate the flow of food into the small intestines, causing patients to need vitamins to help digest the food thoroughly. The pouch can also be stretched because of little regulation. Fewer vitamins are needed than duodenal switch surgery because less of the small intestines are bypassed.